In the week following Downtown Boulder’s Fall Fest, the weather is cooling down, the leaves are beginning to change, and fall is in the air. In this week leading up to the first day of fall (today! 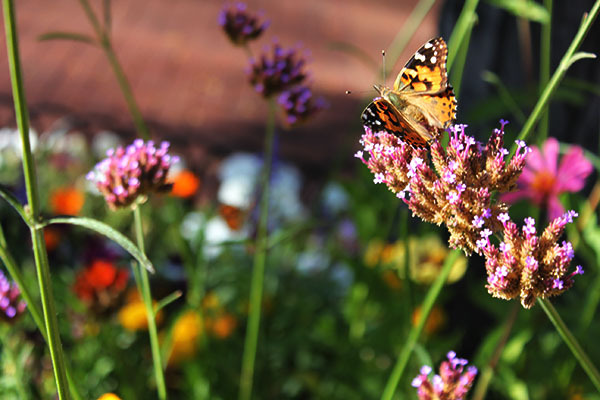 ), you may have also noticed an increase in little butterflies scattered among the flowerbeds along the Pearl Street Mall. If you have walked down the bricks this week, the clusters of butterflies are hard to miss. These butterflies have joined the warm fall colors that are coming into Boulder by adding their own orange-fall-flair to the atmosphere. This particular breed of butterflies are known as Painted Ladies, and are on their fall migration route south for the winter. This particular fall is special, because there are more Painted Ladies around Boulder than usual, and they did not pass through Boulder during their spring migration. These little guys can be found all around the Front Range, but have been extremely noticeable in Boulder. This sudden influx of butterflies brings a warm welcome to what is in my opinion, the most beautiful season in Colorado. In a town covered in leaves, Boulder gets coated in reds, oranges, browns, yellows and every color in between. The Painted Ladies add a flare to this scenery, but are likely here for just a few more weeks! Head downtown for shopping, a bite to eat, and to admire all the little butterflies scattered about before they’re gone!